Neodynamic ImageDraw for ASP.NET is the definitive solution for professional web imaging design, exclusively developed for ASP.NET applications. ImageDraw is a set of server controls (ImageDraw, ImageDrawButton, and ImageDrawMap) which generate real time on-fly Dynamic Composite Images for ASP.NET Web Applications. ImageDraw allows you to use all the potential of GDI+ to dynamically create composite images (Supporting image files, text like captions and watermarks, stylized texts a.k.a. WordArt, and AutoShapes such as lines and arrows, rectangles, ovals, polygons, stars, callouts (a.k.a. speech bubbles), paths, etc) with lots of useful built-in Imaging Effects like drop shadows, reflections, perspective views, Polaroid, filmstrip, scaling, resizing, skewing, and so on. You can use ImageDraw to deliver real time dynamically generated composite images such as picture thumbnails, image buttons, image maps or any other graphical application. The ImageDraw Object Model is very flexible and powerful. 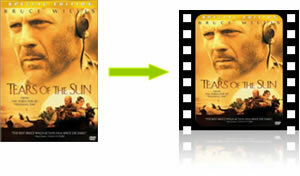 ImageDraw controls generate Dynamic Composite Images and the main characters in this scenario areCanvas and Elements. 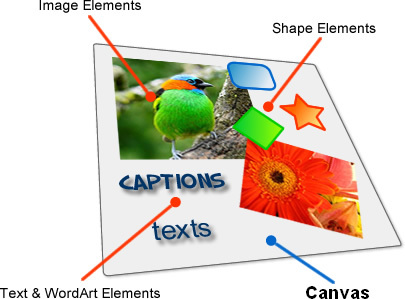 Canvas is a rectangular area intended for drawing Image, Text, and Shape Elements. It plays a key role in the ImageDraw architecture because it governs and determines the final size for the output composite image to be generated. Elements are simple graphical objects which areassembled together to create a composite image. All elements are drawn on theCanvas in the order that each of them has in the stack of elements (the Elements property that each ImageDraw control features). In addition,each element can have associated to it zero or more imaging Actions that affect its appearance (more on this later). ImageElement which simply wraps an image or picture that must be drawn on theCanvas. Those images or pictures can be acquired from several sources such as aURL or path file, Base64 string, byte array, or System.Drawing.Image object. TextElement which simply wraps a text string that must be drawn on theCanvas. TextElement objects are created by specifying some basic properties such asText, Font, ForeColor, StrokeColor, etc. TextElement are useful for drawingcustom captions and watermarks. RichTextElement which render rich text by mixing words in different fonts, sizes, capitalizations, foreground colors, etc. WordArtElement which are stylized texts with special effects featuring gradient color fills and shaping. WordArtElement objects are created by specifying some basic properties such as Text, Font, ForeFill, StrokeFill, WordArtShape, etc. ShapeElement which are preset shapes like rectangles, ovals, lines, arrows, stars, and polygons that can be drawn on theCanvas. AutoShapes support imaging effects, text inside them by allowing padding text feature, border roundness and dashed patterns. Most time, Element objects (ImageElement, TextElement, WordArtElement, ShapeElement and RichTextElement) will require some "retouching" such as resizing, scaling, FX effects, etc.Actions are imaging effects that are applied on any Element objects. You can easily apply more than one Action on any elements. ImageDraw comes with 51 useful and impressive built-in ready to use Actions. ImageDraw features XML Template i.e. you can instruct an ImageDraw object for exporting/importing the composite image in XML text formatting. By invoking a simple class method you can get a string representation of the Output Composite Image in XML format allowing you to save it in any kind of data source be it SQL Server Database, file on disk, and so on. In the same way, you can restore the Composite Image from a XML Template by just invoking a simple class method as well. As stated before, ImageDraw architecture allows you to apply more than one Action on a given Element (ImageElement, TextElement, WordArtElement , ShapeElement and RichTextElement). The following figures show how some combination of Actions applied on an Element can improve its appearance. Dynamic image composition supporting Images (from files, base64 strings, BLOBs, etc. ), Texts & WordArt (autosize, multi-line, custom font files support), andAutoShapes like lines, arrows, rectangles, rounded rectangles, polygons, stars, ovals, callouts (a.k.a. speech bubbles), paths, and so on. Lots of useful Imaging Effects out of the box, including: Adjust Brightness, Contrast, Gamma, Hue, Saturation, Opacity, HSL; Convert To Grayscale, Negative, Sepia, Black & White; Crop, Drop REAL Shadow, Flip, Make Transparent, Perspective Shadow, Resize, Scale, Rotate, Round Corners, Silhouette, Stretch, Decorative Border, Glass Table, Mail Stamp, Polaroid, Filmstrip, Skew, Perspective View, Camera view, Gaussian Blur, Distort Corners, Remove Transparency, Perspective Reflection, Red-Eye Removal, Feather, Glow, Fade, BitmapMask, Remove Pixel, Color Substitution, Tint, Emboss, Solarize, Pixelate, Sharpen, Focal Grayscale, Focal Pixelate, Focal Soften, Focal Tint, and Museum Matte Frame. Accepts as image sources the following formats: GIF, JPG/JPEG, BMP, TIFF, ICO, WMF, EMF and PNG. 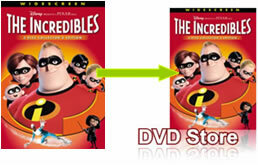 Renders images on-fly in formats such as GIF, JPG/JPEG, BMP, Wireless Bitmap (WBMP) and PNG. High Quality Resolution for output composite images supporting DPI setting. Support for handling Multipage TIFF files. Data Binding support allowing you to render images stored in a BLOB (Binary Large Object) field of a SQL Server database table. Data Binding support allowing you to render images stored as Base64 strings in XML files or returned by WebServices. Image Caching capabilities (Memory, Disk and SQL Server Database). ASP.NET 64-bit (x64 and Itanium IA64) support. ASP.NET Mobile Support by including Wireless Bitmap (WBMP) output image generation. Internet Explorer, Netscape, Opera, Mozilla, Firefox, Safari, Google Chrome, etc.